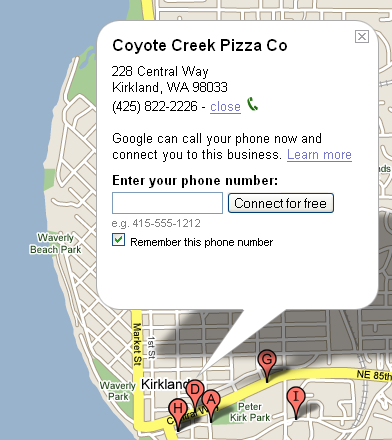 juberjabber: Google Maps adds "Click-to-call"
Now, when you do a search for a business (in the US), the search results display a call link next to the phone number of the business. Clicking this link brings up a field where you can enter in your own phone number. When you click the "Connect for free" button, Google will ring your phone at the number you supplied, and your (free) call will be connected. No microphone, no software needed - it uses your existing phone. Your phone number will also be saved so that you won't need to enter it again the next time. Here's a search for pizza restaurants in Kirkland... click, click, and order! For more info, see the announcement on the official Google blog. Is this related to the announcement made between Google and Ebay to create a click-to-call service which would use Google Talk and Skype? It has the same name, so does this mean we can expect Google to integrate this click-to-call service with Google Talk, and start to make Skype and GTalk interoperable as was hinted at in the blog post? The recent inclusion of Skype in the Google Pack is curious. I noticed this 'click-to-call' telephone icon appear in some of the sponsored links for Google search a few weeks ago too. Hi there, very good work. Can you just tell us when it will available on italian Mappe as well? I understand the company providing this technology to Google is a company called VoIP, Inc. out of Orlando. Very cool company! The new feature is live. Instead of writing call every time next to a phone number, wouldn't be easier to just link it? What would be sweet is if you could see their GoogleTalk chat/voice status on the maps system. Then you'd have a "virtual intercom" to the business. Cool!